Cleverly, Sai Baba repeatedly warned against listening to or spreading rumors. He compared this to dogs barking at nothing (eg. p. 130, Sathya Sai Speaks, Vol 13). Remarkably, however, his ashrams and movement were certainly far more subject to rumours and unconfirmable stories than any other place I have ever been. Many originated from him in interview sessions and were then reported outside, where they spread on the jungle telegraph to become 'established hearsay', which he then neither needed to confirm nor reject. Why was all this so widespread in the Sai movement? 'Rumours' that criticize Sathya Sai Baba - many of which are but plain facts - are the kind that are denounced, while the wildest rumours making Sathya Sai Baba seem much more than he is, are still allowed to spread unhindered. There are countless baseless accounts of miracles, more and less fantastic 'stories' and incredible claims circulating in the Sai movement. Many of thesehave long been supported and encouraged by Sai Organization's office-bearers, and even the worst were tolerated as an enhancement of Sai Baba's fame without any comment or refutation. It was considered better in most cases to keep quiet rather than draw more attention to the fantastic claims people make about Sathya Sai Baba. A large number of stories that were constantly repeated have definitively been shown to be inventions, while many others simply cannot be true because they defy all feasibility. There is no limit to what is possible in most Sai devotees' minds, for "Swami is the all-powerful Godhead". The many miracle stories have been embroidered out of subjective experience, interpreted within the framework of the mythology of Sai Baba and Indian deities in scripture and mythology. Not a few such claims have been shown to result from misunderstanding or even sheer inventions, but the were the daily bread and wine of a mass of devotees... a fact to which I can attest through my hundreds of conversations with followers from many countries of the world through two decades. One of the causes of most rumour mongering is a regime of secrecy and suppression of fact. The culture of secrecy - and of misinformation that may not be challenged - combined with total unaccountability for anything at the ashram, provides the climate in which rumours thrive to levels even beyond the hearts' most surreal desires. One condition for such confusion to flourish, that of clamp-down on facts that might prove at all embarrassing, was certainly fully fulfilled by Sathya Sai Baba and all his various institutions, not forgetting the authoritarian and cultist Sathya Sai Organization. Blankly refusing any kind of reasonable scientific investigation under controlled environments of his "materialisations", Sathya Sai Baba played all his many marked cards very close to his chest at all times and backed this up by spreading his own incredible rumours... mainly through private interviews, some few examples of the very numerous instances are recorded on this website. No one could question him freely, let alone buttonhole or corner him, for his position had soon become of such social power that he answered to no one for anything and was ever surrounded by a horde of fanatical sycophants who protected him in all ways (with undercover Israeli-trained commandos and automatic weapons in profusion at the ashram in case of more physical events). These officials were ever on the watch for dissent, aimed to stop all open questioning discussion, and they removed and banned critical persons from the ashram and excluded them from the Sathya Sai Organization without their having any chance of redress or even without offering any explanation to them. Spreading rumours is a very effective kind of deceit and abuse of people's trust for those wishing to achieve certain ends. One of those ends was certainly to convince the world that Sai Baba was the ultimate avatar with supernatural powers surpassing even those of any known previous deity. Many stories came direct from Sai Baba in the interview room, including the so-called 'private' interviews where he was occasionally alone with one person, with a couple or a small group. He had made it known that what happened in the interview room was to be kept private between those present as a priceless divine blessing. Many followed this advice, but - as one can expect - many soon spread the details to their friends and othrers both within and outside the Sai movement. Sathya Sai baba would certainly have known this and reckoned on it too. He never made any public statement about what had been leaked out, not unless they posed such a major problem that he was eventually forced to make a public denial. This eventually occurred in the case of the famous '27 predictions of catastrophe' which he was widely reputed to have told 18 of his students. (Some versions have 38 points, mostly predictions). After about 15 years of constant circulation of these dire world disaster warnings, where survival and safety was made to seem something reserved virtually for Sathya Sai Baba devotees alone, the hysteria among the world-wide Sai movement (and other impressionable cults too) became so great that something simply HAD to be done. Confronted with the situation by several top foreign devotees, Sathya Sai Baba finally had to denounce it all as mere rumour and speculation in a discourse on Shivaratri in 1991. (detailed and discussed here). Another unusual case of suppression of a 'rumour' took place in 1998 when Sathya Sai Baba told people of a coming air traffic crisis due to earth magnetic forces disturbing navigational equipment and warned interviewees not to travel by air at that time... a specific period of some days (see report). Needless to say, the incident Sathya Sai Baba predicted never occurred, as has also been the case with the large majority of his predictions. The constant talk - backed by Sathya Sai Baba's own assertions in numerous interviews - that many of the rings and earrings he gives are 'genuine diamonds', is a prototype of his rumour mill. There is no documented foundation anywhere by anyone to show that Sathya Sai Baba has EVER given away a single diamond of any appreciable value. Yet I have documented how the Queen of Denmark's private jeweller, Mr. Peter Hertz of Copenhagen, assayed a green stone in the ring he gave me making clear it was a diamond, was actually a cheap fake sapphire. Sai Baba 'experts' had judged it to be a green diamond of about 6 carats worth into the millions of dollars, also according to devotees and hearsay from all kinds of sources alleged to be reliable (but without any serious documentation). It is a near-valueless synthetic sapphire with green tinfoil behind it to make it shine very brightly. Sathya Sai Baba not only lied outright about these stones (I heard him do so several times, such as to a Mr. Kaufmann from Denmark in 1988) and he very willingly let these falsehoods spread on a very large scale! He strictly warned people not to doubt or get them assayed, so no remaining followers have ever done so, and others claim that - if one does so - the item may disappear (it never has in my experience of thse trinkets) or much worse consequences could afflict the doubting Thomas (even in a supposed future lifetime). Thus he was the chief rumour monger himself, and had the sheer impertinence to preach to others that this is akin to evil or demonic behaviour! Though he did give away genuine gold rings and other golden objects, he NEVER said his supposedly priceless gifts were the often valueless trinkets they are, even though their amazing value is still talked about. The dissemination of rumours creates many conflicting accounts of one and the same event or fact. This brings confusion, which condition was one of the major aims of disinformation techniques in Sathya Sai Baba's repertoire. One classic example, he let his younger brother, Janakiram, persist in claiming the intruders into his temple and private rooms in 1993 - who killed two attendants with whom they came into conflict in a knife battle - were also aiming to assassinate Sathya Sai Baba (he may have put his younger brother Janaki Ramiah up to it, but we don't know because he himself got away scot-free without facing any questioning whatever). Janaki Ramiah several times claimed to the press that it was an assassination attempt on Sai Baba. He was in effect rewarded by Sai Baba with effective control over the entire gigantic funds of the Central Trust, which he enjoyed until his death in late 2003). Meanwhile, Sathya Sai Baba denied there was any attempt on his life in the 1993 incident, putting this on record in his Gurupurnima discourse of that year and refusing to bring charges against any conspirators due to alleged lack of evidence of any murder plans etc. This created complete confusion where it was most needed to cover up facts, after which it was somewhat easier for the Andhra Pradesh authorities - not acting without higher orders - to quash the continued investigation of the unfinished case! Prof. Kasturi also modified his standpoint of complete trust in Sathya Sai Baba when he told me in his later years that Sathya Sai even claimed that what was recorded on a tape Kasturi made in his presence was NOT WHAT HE HAD SAID! It was evident that he had some doubt about this... and he wondered what I made of it. I must admit that I was somewhat befuddled and had to disregard it as best I could. Then, but not any longer, though! His response to those who dare to point out a possible discrepancy in what he says and does was as if to rise up like a cobra if he thought he was being confronted. He would avoid being held to account by using any kind of deceit and usually called it "His divine leela" or the like. He saw how devotees swallow everything (well, most of them most of the time, anyhow). Incidentally, Sathya Sai Baba once claimed in a discourse that he was 'the lion among animals, the eagle among birds' (Sathya Sai Speaks Vol 8, p. 13). Since he also claimed that he appeared as a hamadryad to devotees in the past, he is then 'the king cobra among reptiles'. One can divine what he was driving at... massive pride and no real compassion to anyone who aroused him, as also pointed out by his one-time chosen 'soul-brother' in his teenage years - Krishna Kumar -who shared his sleeping room for years but then left him permanently. The whole approach to every fact by Kasturi, his every perception, was trained by Sathya Sai Baba and modelled clearly on the belief induced in him by Sathya Sai Baba that he was the one and only full avatar of God in this aeon. He collected every scrap of hearsay around in Puttaparthi and applied himself to weaving it into a eulogizing hagiography. His 'biography' reads like the systematic application of Hindu iconography to Sathya Sai Baba, which greatly weakens its credibility and will surely be seen as unreliable and mostly second-hand hagiography by proper religious scholars and researchers everywhere. The mythology has long since begun to fall apart at the base in that central dates and events have been shown not to be in accordance with official school registers or even with the calendar. These are the kind of facts that are of a fundamental and often conclusive nature for historians and objective researchers of all kinds. 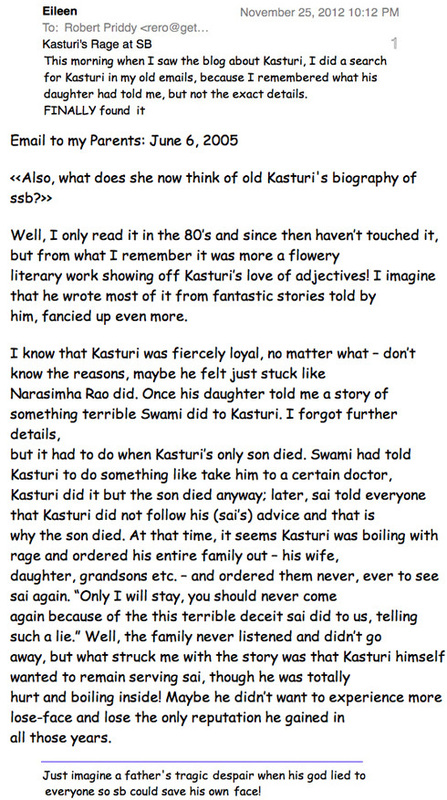 Kasturi never learned journalistic rigour for, though a professor of history, he engaged a lot in humour and poetry or in radio causeries on spiritual subjects. It seems that Sathya Sai Baba eventually began to realize that he needed to sanitize the literature of the unconfirmed and unconfirmable stories a good deal so as to gain more acceptance among the less gullible community and more serious persons. When the top professional journalist V.K. Narasimhan took over from him, initially in the early 1980s, he was instructed by Sathya Sai not to publish accounts of dreams, healing powers or other miraculous phenomena... the sort of material in which Kasturi had literally revelled in Sanathana Sarathi, in his 'biography' of Sathya Sai Baba and in his autobiography. Narasimhan managed to stick to this fairly well, with lapses here and there. The Sathya Sai Organisation took this suppression of the many fantastic 'stories' much further and, into the bargain, also virtually banned publicity about much of what Sathya Sai Baba repeatedly claimed about himself, his powers and his miracles. This need is dictated by gaining credibility for its work in extending the Sathya Sai Baba influence and the various works they undertake (doubtless mostly with the best of intentions) which increasingly require social acceptance and the public 'blind eye' to the activities of Sathya Sai Baba himself.